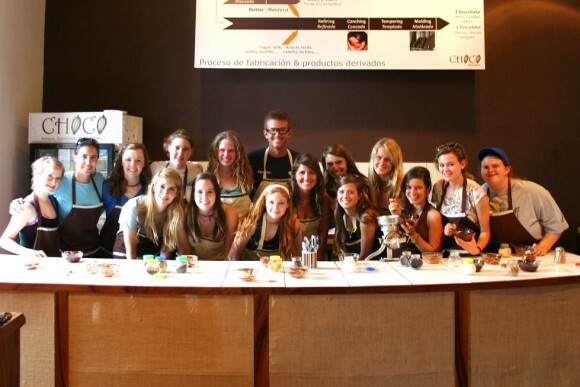 “Who’s that old creeper hanging out with all of those high school girls?” Those who passed the open window of the chocolate making school in Antigua were all certainly wondering the same thing. Sure, Sheena and the girls’ chaperone were both my age, but they blended into the sea of adolescent femininity like snakes in grass, leaving me the odd man out. The 28 year old creeper. The class was riveting, and our high school classmates were a vivacious bunch. They hailed from Georgia, I believe, and were in Guatemala for some kind of weeklong church trip to a Mayan village. 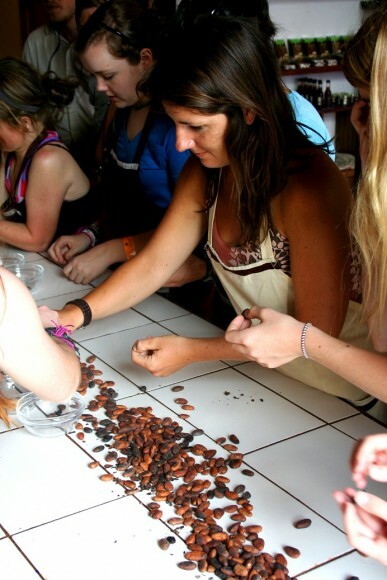 With the help of our instructor, Pablo, we roasted cocoa beans and turned them into all sorts of goodness. After having shelled, and pulverized the beans in a mortar, we made Mayan hot chocolate. 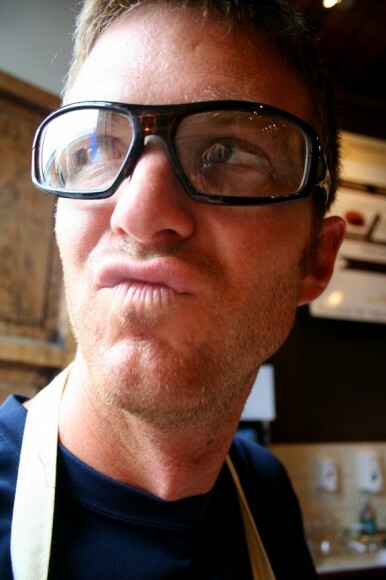 As I sipped on my tiny ramekin of hot cocoa I spied something that nearly caused the spicy concoction to squirt out of my nose: one of the high school girls tilted her head in such a way that she looked almost exactly like our friend Shawn Kramer. It was uncanny! Who’s that old creeper staring at that high school girl? Creeee-pyyyyyy! 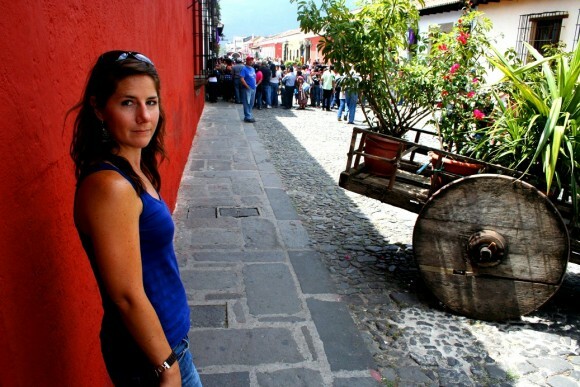 We arrived in Antigua, in the southwestern corner of Guatemala, after having crawled across the country over the course of two weeks at a mere 15 miles per hour, give or take, due to heinous roads. At long last, we had reached the final major outpost before the Salvadorian border. While Antigua was a well cared for colonial town, we had unexpectedly found the country to be, by and large, economically ravaged. I suppose it’s only natural given their turbulent recent history. In 1954, the CIA sponsored a military coup to overthrow the government of Guatemala. It’s well documented, not conspiracy theory. The goal was to create an authoritarian government in place of Guatemala’s functioning democracy for the sole purpose of protecting US corporate interests (primarily a banana company that supplied fruit to the USA). Between 1954 and 1990, about 300,000 civilians were murdered and the country’s economic development remained at a standstill. And that’s what I mean by turbulent recent history. When we arrived in Antigua we made our way to the office of the tourist police, the Asistur, where we had heard we could camp for free. Lo and behold, just outside of downtown we found a walled compound filled with abandoned cars, bombed out buildings, and a small office containing the tourist police. 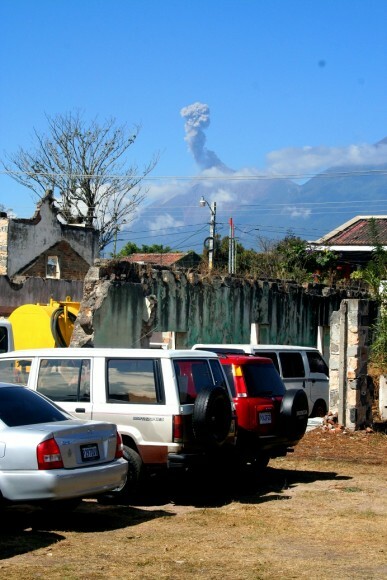 It had a nice view to the southwest of a live volcano, only a couple of miles away, which erupted every day. We drove in and found a place between the Australian couple we’d met in Tikal, and the French family we’d camped next to in Lago de Atitlan. Running into the same group of overlanders has become a regular and welcome occurrence. 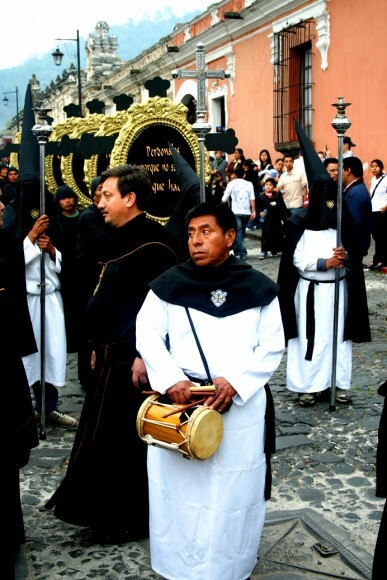 At any one time there are a number of groups making the trip down the Pan-American Highway on similar schedules. The result is that every week or so we come across someone we know. There’s Thomas, the Swedish guy we met Palenque, Mexico, who takes public transit, and whose good looks have made him irresistible to even the most macho of male Guatemalan hotel employees. There’s the French family driving in an RV and homeschooling their two children along the way. The Austrlians Chris and Wendy, as well as the Americans James and Lauren from Home on the Highway are both driving Toyota 4Runners and making us jealous with the speed at which they can drive over topes. 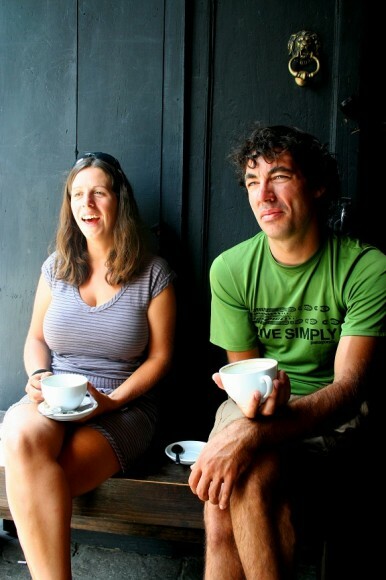 Toughest of all are Barbara and Achim, the German couple, riding their bikes from America to Argentina. They’re on flat pedals with hiking shoes, always seem to be in a good mood, and are keeping pace with us in our van. As we settled into our place at Asistur, chewing the fat with the French and the Aussies, who should come strolling into our camp but Barbara and Achim. Wendy and Chris, having planned to leave that day, decided to stick around for another day just for the hell of it. We had catching up to do. We would spend the next four days hanging out with Barbara and Achim. Friends, just like back home, except that we’re all homeless and unemployed. 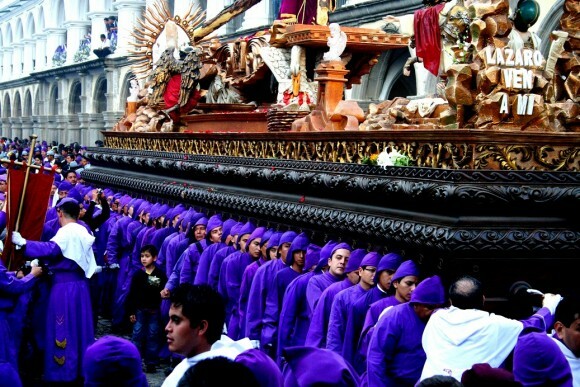 It just so happened that we arrived in Antigua just in time for the pre-Semana Santa religious processions. In this display, families stake their claim on a patch of the procession route; a daylong circuit winding through the streets of Antigua. 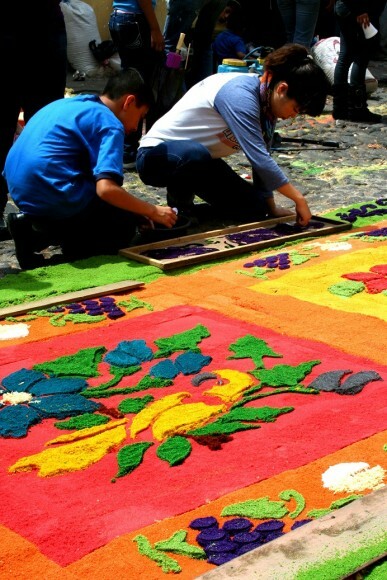 The families spend immense amounts of time creating beautiful “carpets” In the street. 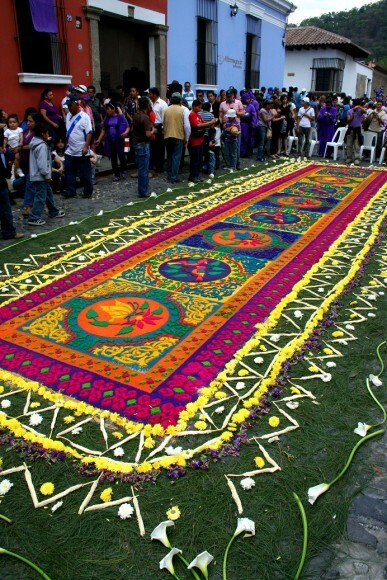 The carpets are actually artistic scenes made of colored sawdust, flowers, vegetables, and other objects, and are created by the devotees on the day of the parade. They’re an obsessive-compulsive person’s dream: sawdust grains ordered in such a way, and on such a grand scale, that it blows the very minds of any and every observer. 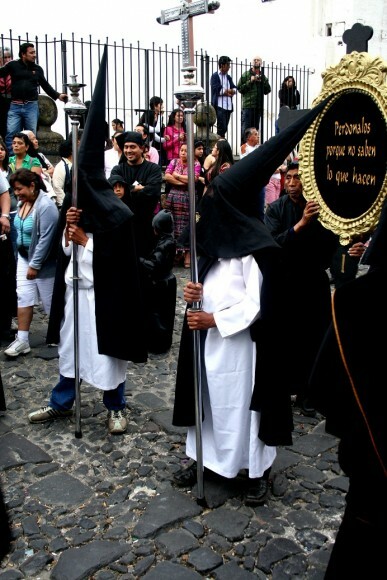 As the procession passes through the streets, the carpets are destroyed by the trampling of men and women wearing pointed caps, brandishing instruments, and carrying heavy wooden floats adorned with fake Jesus puppets spewing pump-driven fake blood. 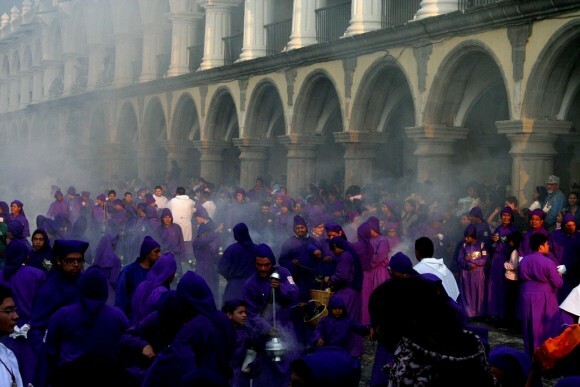 One million people packed into Antigua’s streets like sardines to watch the carnage. It was like a religious Disneyland! Sitting at the German microbrewery in Antigua with our Bavarian friends, we reflected on Guatemala. It was tough. I do realize that we plan to drive our van through China, India, and the Middle-East, and that those will undoubtedly be tougher. 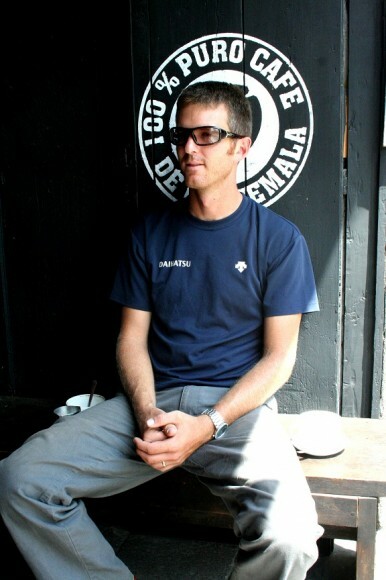 But we’re just getting started, and Guatemala was tough for us. We’re still in the shake down period, figuring out what works and what doesn’t. This country was a test. We ordered new car parts and had them sent to Costa Rica. We compiled lists of lessons learned. We hit many lows and not very many highs. But we made it through. And after all of that, we took our pent up frustration out on a bunch of cocoa beans, yielding a mediocre ramekin of sugary chocolate milk, and the everlasting impression burned upon the minds of those who passed by us, of the Antigua Creeper and his cohort of Georgian high school girls. You should have upped the creeper vibe and snapped a photo of Shawn-as-a-high-school-girl. My imagination will have to suffice. Imagining…. Hey! Shawn looks good in a bow! Great update! 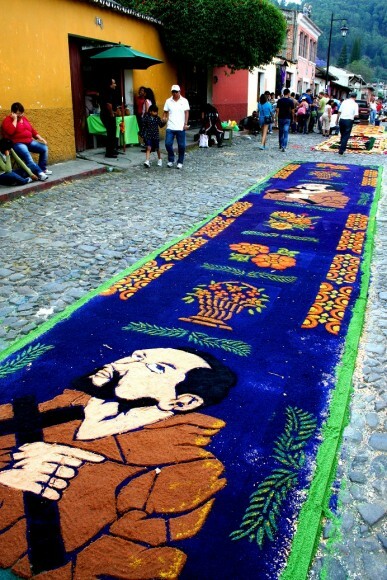 Those Murals/sawdust carpets are incredible! Such beauty to end with in Guatamala. I was thinking about your journey and what you may need. I have access to an incredible amount of affordable VW parts. I am concerned about your spares and what you have. I am a two of everything kind of guy and like to have spares. The wheel bearing thing got me thinking about that. How would I ship you some spares? What kind of room do you have? I am think starter? Alternator?bearings, brake pads, master cylinder, etc. I can not spend much, but if I can ship you stuff I would be glad to donate when I can. You should be able to see my email address, so let me know and be safe. @Kelly: You think I didn’t jump at the chance to push the creeper thing to the next level? Come on, I thought you knew me! I took several photos of her, and will do a full Shawn-as-a-chick photo update on Facebook. I love the picture of Sheena against the red wall! Hugz. Oh, come on Brad, you couldn’t be creepy if you tried. What Sheena doing in that one pic talking to that dude? Looks like she is a shooting a commercial or something? 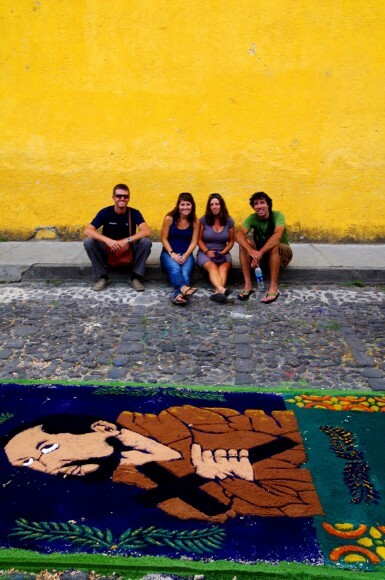 Im sad we missed the carpets of Antigua, you got some great shots though. @James: That group of collegiate youths cornered us in the street and interviewed us for their English course. Some kind of homework requiring them to interview native English speakers. The same thing happened to us in Mazatlan. The funniest thing was that the first person they asked to interview was Barbara, who is German. She pulled it off though. @Brad, I will be anxiously awaiting the creep-star FB photo update. Standing by. The other day here in Prescott the city blocked off a huge parking lot where artists from all over, along with locals who just wanted to participate, drew phenomenal creations in chalk. I thought that was impressive . . . and then I saw those carpets of Antigua. Amazing! Made the chalk drawings look like graffiti on a classroom chalkboard! I am blown away by those, and all your other photographs. And now my mouth is watering for chocolate. No surprise! Happy you are past Guatemala and on to Costa Rica!